The Makita is a superior blower, but also more expensive. The Makita BBX7600N backpack blower and the Husqvarna 350BT are two excellent products that will serve you well when it comes to clearing leaves and debris around your yard. Before we get into the specifics of these leaf blowers let’s take a broader view and consider why removing leaves from your property is a good idea in the first place. Let’s be honest, blowing leaves might seem silly at first but there are practical reasons to invest in a backpack blower, or a handheld blower. It really depends on your needs and how big of an area you need to cover. Do You Really Need a Backpack Blower? Why remove leaves in the first place? Trees decorated with a palette of warm colors. A cool breeze caressing our skins on a clear, sunny day. Enjoying a hot cup of cocoa looking through the window on a quiet, rainy night. The arrival of autumn comes full of many different charming sights but as beautiful as they may be, they can be quite a logistical nightmare as well. Leaves falling down from trees cumulate on a daily basis but fortunately, those days where we would be forced to clean our own yards manually with a rake are long gone. We can now make use of technology to ease our lives and minimize our efforts. However, with a myriad of options in the market to choose from, knowing which product will best suit our needs can be as challenging as the task itself. Not to worry, though, in this article we will discuss thoroughly and objectively all the different types of products available in the market, their differences, pros and cons, relative price ranges, and most importantly, the type of task for which they will perform best. At the end, choosing the perfect leaf blower will be as easy as cleaning the yard with them. Released in 2016, this Dewalt blower is an impressive piece of technology. But before we start, let’s clear some fog out of a question that is bugging homeowners and landscapers alike. Should we actually remove dead leaves from our lawns? Rolling over them is quite therapeutic. We all love to do it, our children love it, even our pets enjoy it too, but what would happen if we just left them to be? Can they become a threat to our lawn? Well, the short answer is yes, but here is why. If not removed, dead leaves can create a layer which would eventually block the sunlight from reaching the grass and also inhibit the evaporation of water. This moist environment will encourage the growth of mold and fungi, which can be very aggressive to the growth of new grass and can kill it quite rapidly. However, dead leaves are not the enemy. If treated properly, they can make a powerful and fertile compost which will aid in the fertilization of the land, they work marvels when settling a new garden, and they can also be placed around younger, smaller trees to invigorate their growth. But if left alone and untreated, they represent a threat to the overall health of our lawns, which could result in the need to re-turf most – or all of it, an effort which is both costly and time-consuming. Shown above: Troy-Bilt TB4BP EC and the Husqvarna 580BTS. Let’s take a look at our options to remove leaves from our lawn and garden. First of all, it’s very important to understand that there are two kinds of leaf blowers to choose from. Handheld Leaf Blowers and Backpack Leaf Blowers. The former is almost always cheaper and way smaller too, while the latter is more expensive and quite larger in size, but can prove to be more efficient in the long run. Nowadays, more and more people are starting to prefer backpack leaf blowers over handheld leaf blowers because of their task versatility and ease of use, because they can work marvels in both small yards and sidewalks, as well as larger fields and parks. Nonetheless, handheld blowers are still relevant for some specific scenarios, such as tight gaps behind hedges or blowing off rooftops, where the larger size of a backpack blower could prove to be difficult to handle, and possibly even dangerous. Exceptional quality and comfort makes this a great choice for large clearing tasks. 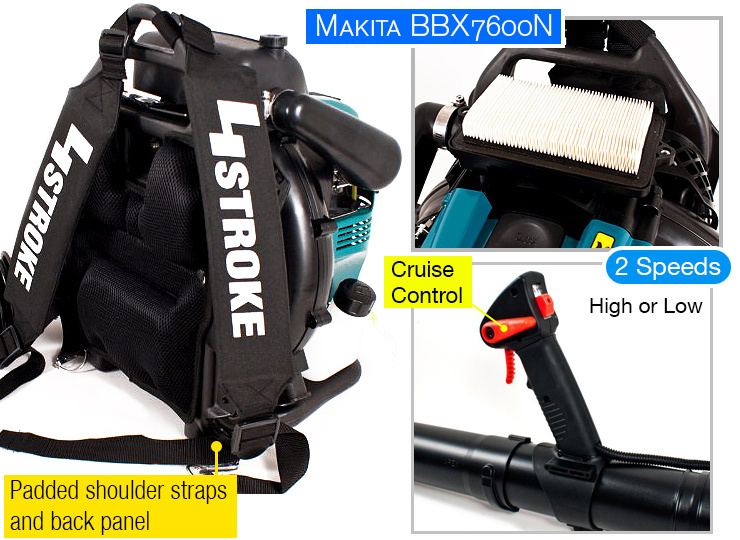 Now, let’s take a look at the Makita BBX7600N Backpack Leaf Blower. This product comes with a 75.6 cc engine, 3.8 hp, and is one of the few blowers available in the market with a 4-stroke engine, which makes it both powerful and fuel-efficient. Although most 4-cycle blowers can be quite bulky and noisy, the BBX7600N weights a modest 22.6lbs all while being relatively quiet, emitting only 74 decibels thanks to its large capacity muffler. When choosing a backpack blower, it’s important to know the exact values of airflow and air speed. This blower produces an efficient combination of 195mph of air speed with 526cfm of airflow, which is better than most of its commercial pairs. Because this type of blower is intended for extended use, comfort is paramount. Engineered for durability and comfort. The BBX7600N comes with padded shoulder straps and back panel along with a soft grip designed for less vibration equipped with cruise control, providing a stress-free user experience. Overall, the Makita BBX7600N is ideal for most purposes. It makes quick work of small to medium yards and sidewalks, but it doesn’t shy away of larger fields, even on wet or snowy terrains. All of these features make this product slightly more expensive than its other competitors, but in the long run – and especially if you’re planning on working on larger landscapes – the investment is definitely worth a shot. Mid-size blower that is extremely well-made and affordable for homeowners. Another suitable Backpack Leaf Blower option is the Husqvarna 350BT. This product is equipped with a 50.2 cc engine, 2.1 hp, and maximum power speed of 7500rpm. With a total weight of 22.5 lbs, the 350BT delivers a slightly smaller efficiency ratio. With a maximum air speed of 180mph and a total airflow of 494cfm, it stands a little bit below the Makita BBX7600N in terms of power, however, it will still work wonderfully for most homeowners, but it might fall a bit shy when working on larger landscapes. It’s also noteworthy to say that the 350BT is a cheaper alternative to the BBX7600N, and it’s a great choice for most cases, so long as its limitations are accounted for. Purchase the Husqvarna 350BT backpack blower along with (three) Husqvarna 32 ounce pre-mixed fuel, register your product online, and your consumer warranty will be extended from 2 years to 4 years. 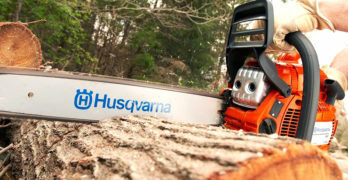 Read more about the Husqvarna extended warranty program. 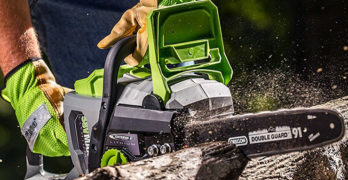 Note: This offer is for all Husqvarna two-stroke gasoline powered handheld product, which includes: chainsaws, blowers, hedge trimmers, pole pruners/saws and trimmers. Extremely reliable and efficient. An excellent blower for clearing small areas. 23.9cc, 1.13 HP 2-stroke engine. Well-balanced, ergonomic makes it easy to use for long periods of time. Large two finger throttle lever. Easier to control. Pure Fire II low-emission engine technology. Minimizes pollution. Auto-return stop switch automatically resets to “on” position for easier starting. As stated above, handheld blowers are still quite relevant to some working scenarios and should not be discarded on regard of their more popular cousins. Here we will take a quick look on the Hitachi RB24EAP. It comes with a 23.9 cc engine, 1.13 hp, and a 2-stroke cycle. Relatively small in size weighing only 8.6 lbs, it still maintains a respectable 170mph/441cfm air speed-to-airflow ratio. This blower is ideal for cleaning smaller gaps and tight areas which would be difficult to access with a backpack blower. It also comes with a large two-finger throttle lever for easy operation. The Hitachi RB24EAP can prove to be a real lifesaver, and is a worthy addition to your bag of tools — or shed of tools. DEWALT has finally created an affordable battery backpack blower. I had to include this DEWALT handheld blower because it’s a wonderful product that I truly believe homeowners need to consider. Not only is quiet at 67 dBa but it’s environmentally friendly and does not produce any emissions or fumes. It’s not as powerful as a gas backpack blower but for the majority of homeowners it provides more than enough air power to clean the yard. Up to 450 CFM of air volume at 142 mph. Brushless motor optimizes battery life and runs cooler than traditional motors. Dual high capacity 40V MAX* 7.5Ah batteries for long run-time. Variable trigger and speed lock. You’re in control. View or download the MANUAL or the PARTS LIST for the DEWALT DCBL590X2. 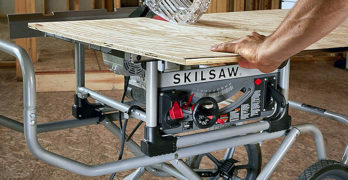 We covered the 40V DEWALT system in our article on the DEWALT cordless chainsaw. Makita BBX7600N vs Husqvarna 350BT? Which leaf blower is right for you? To wrap things up, there is not one perfect leaf blower choice for everyone. Both backpack leaf blowers and handheld leaf blowers are great, powerful tools for homeowners and professional landscapers alike. It’s important to know that we can’t solve all of our needs with a single tool. So instead, what should drive our choice is understanding which working scenario we will encounter the most, and then selecting the type of leaf blower that will perform that task more efficiently and more comfortably to the operator. Another factor to consider is determining how often the blower will be used, so that it will pay itself off in a time frame well within its lifespan, without compromising its performance. 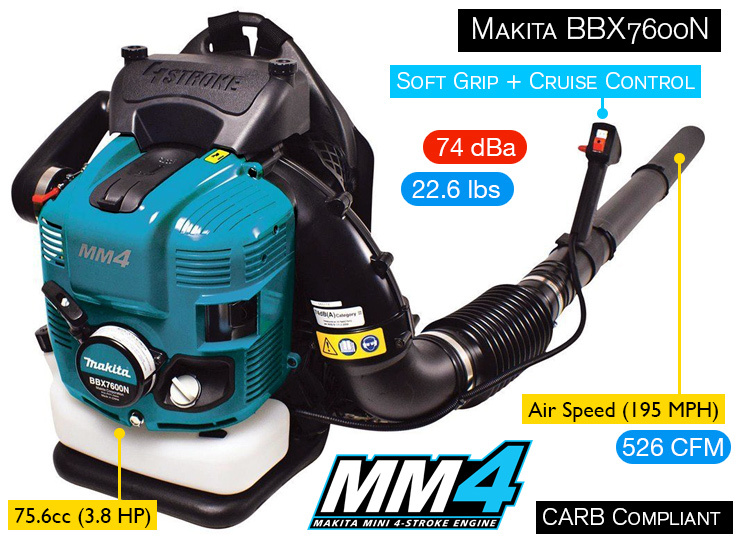 Makita BBX7600N is a 4-stroke engine which is superior to the 2-stroke engine. Watch the video below to help you understand the differences.